CrossCountry is a train operating company in the United Kingdom owned by Arriva UK Trains, operating the New Cross Country franchise. It operates many intercity and other long-distance trains in the UK which do not serve Greater London, including the UK's longest direct rail service from Aberdeen in the north-east of Scotland to Penzance in Cornwall, in the south-west of England. It is one of only two franchised train operating companies that does not operate any stations. All routes call or terminate at Birmingham New Street. In June 2006 the Department for Transport announced its intention to restructure a number of franchises. Included was a New Cross Country franchise that would incorporate the existing InterCity Cross Country franchise run by Virgin CrossCountry, less the West Coast Main Line services with the Birmingham to Scotland services transferring to Virgin West Coast and the Manchester to Scotland services transferring to First TransPennine Express. Some services from the Central Trains franchise were to be added. In October 2006 the Department for Transport issued the Invitation to Tender to the shortlisted bidders, Arriva, First, National Express and Virgin Rail Group. 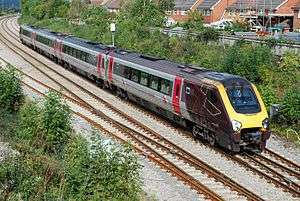 On 10 July 2007 the Department for Transport announced that Arriva had won the New Cross Country franchise with the services operated by Virgin CrossCountry transferring to CrossCountry on 11 November 2007 along with the Cardiff to Nottingham and Birmingham to Stansted Airport services from Central Trains. Originally due to conclude on 31 March 2016, in March 2013 the Secretary of State for Transport announced the franchise would be extended until 9 November 2019. The company operates a number of key InterCity routes outside London including the Cross Country Route from the North East to the South West. 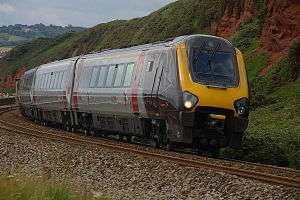 there are trains to Newquay and Paignton from Manchester Piccadilly, Dundee, Glasgow Central, Newcastle Central and Edinburgh Waverley on summer Saturdays and Sundays, however the service from Piccadilly to Paignton operates several times a day throughout the year and not just on summer weekends. Birmingham to Leicester: two trains per hour (of which one per hour carries on to Stansted Airport). After taking over the franchise, CrossCountry continued to operate the existing timetable including the West Coast Main Line services for four weeks. When the new timetable commenced on 9 December 2007, the Birmingham to Edinburgh and Glasgow services transferred to Virgin West Coast and the Manchester to Edinburgh and Glasgow services transferred to First TransPennine Express. Plans were included by CrossCountry to reopen a station at Kenilworth. In April 2008 it agreed with Warwickshire Council to draw up a business case. There is a proposal for a station at Worcester (Norton) Parkway where the Cross Country Route route intersects the Cotswold Line. If built, it will be on two levels, with the low level served by CrossCountry, and the high level by Great Western Railway. The high-level platforms at Tamworth are served only by CrossCountry, but are not considered a separate station from the low-level platforms. The whole station is therefore managed by the main operator of the low-level platforms, which is London Midland. Manea was only served by CrossCountry until 2013, when Greater Anglia started running 1 train every two hours at the station in addition to the CrossCountry services there. To try and create a more pleasurable traveling experience, CrossCountry has designated 4 stations as alternative changeover stations. Cheltenham Spa, Derby, Leamington Spa and Wolverhampton were selected. The aim here was to make connection times shorter - with the stations selected being much smaller. For example, meaning that passengers traveling from Cardiff to Edinburgh could change at Cheltenham Spa instead of Birmingham New Street reducing transfer times - at Cheltenham Spa both trains would arrive and depart from the same platform. This avoids having to change trains at Birmingham New Street, which is a larger, more complex station. These 4 stations are marked on the CrossCountry route map, in yellow. Latest performance figures released by NR (Network Rail) for this period (period 7 of 2013/2014) report a PPM (Public Performance Measure) of 89.2% and a Moving Annual Average (MAA) up to 12 October 2013 of 87.4%. CrossCountry services are operated using diesel trains only, since none of the routes it operates is fully electrified. CrossCountry inherited 34 four-carriage Class 220 Voyagers and 40 five-carriage and 4 four-carriage Class 221 Super Voyagers from Virgin CrossCountry as well as 11 two-carriage and 18 three-carriage Class 170 Turbostars from Central Trains. In December 2007 Class 221 Super Voyagers 221101 - 113 and 221142 - 144 were transferred to Virgin West Coast with 221114 - 118 following in December 2008. A franchise commitment was the acquisition of ten Class 43 Power Cars and forty Mark 3 carriages. Midland Mainline had six Class 43 Power Cars and fourteen Mark 3 carriages that were off lease from November 2007 that were leased. The remaining four Class 43 Power Cars were ex Virgin CrossCountry examples in varying states of decay. while the carriages were five ex Virgin CrossCountry Mark 3 carriages and twenty-one ex Virgin West Coast loco hauled Mark 3B carriages. Most had been in store at Long Marston for a few years. After driver training the ex Midland Mainline sets returned to service in May 2008 on Glasgow and Edinburgh to Plymouth diagrams while the other Class 43 Power Cars were overhauled at Brush Traction including repowering with MTU 16V4000R41 engines and the Mark 3 carriages overhauled at Wabtec, Doncaster to a similar specification as GNER's Mallard refurbishments. Once these were completed the ex Midland Mainline examples were also overhauled. The Class 170 Turbostars were refurbished in 2008 with the three-carriage units repainted at Marcroft Engineering, Stoke on Trent, the two-carriage units at EWS' Toton depot and the interiors done by Transys Projects, Clacton-on-Sea including the fitting of first class seating to the Class 170/5s and 170/6s. The tilt function on the Class 221 Super Voyagers was removed in 2008. It was no longer required as tilt was not required on the parts of West Coast Main Line that CrossCountry serve. CrossCountry says this change will improve the trains' reliability and reduce maintenance costs. The Class 220 Voyagers and Class 221 Super Voyagers underwent refurbishment at Bombardier, Derby in 2008/09. This involved removing the shop, adding 25% extra luggage space and fourteen extra standard class seats to the Class 220 Voyagers and 20% extra luggage space and sixteen standard class seats to the Class 221 Super Voyagers. The interiors were given a refresh in 2011/12 with the standard class seats recovered in the existing red and blue moquette and first class done with a maroon moquette. In summer 2014, CrossCountry began removing the quiet coach designation from such vehicles in its Voyager sets, believing them to be outdated and take up an excessive amount of space on a four-car unit. It is retaining the quiet coaches on its five HST sets. The CrossCountry franchise will run until October 2019, with the Invitation to Tender issued in September 2018 and the contract awarded in July 2019. ↑ "Bristol and Manchester linked every two hours in CrossCountry's December timetable" (PDF) (Press release). CrossCountry. 12 December 2007. ↑ CrossCountry. "Frequently Asked Questions: How will the timetable change and when?". Archived from the original on 22 August 2008. ↑ "New Southampton train services" (Press release). CrossCountry. 19 November 2010. ↑ "East Coast Welcomes Future New Timetable" (Press release). East Coast. 20 January 2010. ↑ "London 2012 Olympic Games". CrossCountry. Retrieved 26 June 2012. ↑ "Kenilworth Station stays on track". Warwickshire County Council. 7 April 2008. Retrieved 12 June 2008. ↑ "New county train station is a good idea, says Government". Worcester News. 1 August 2012. ↑ Miles, Tony (August 2008). "CrossCountry stops tilting". Modern Railways. London. p. 71. ↑ Rail Magazine, Issue 755, 20 August 2014, pp. 60-61. ↑ "Rail franchise schedule" (PDF).